The Environmental Investigation Agency’s (EIA) Chilling Facts campaign began in 2008. Since then – it’s now in its third year – we have seen significant progress by UK supermarkets in reducing the global warming impact of their refrigeration and cooling systems. I helped to get the campaign up and running and have been a judge ever since. The first survey results, published early in 2009, were hugely disappointing. They showed that as much as one-third of a supermarket’s carbon footprint was coming from the cooling gases in their refrigeration systems. And, at that point, there were only 14 stores across the whole of the UK using only climate-friendly technologies. The Chilling Facts campaign has focused on getting supermarkets to move away from using HFCs (hydrofluorocarbons) because they have a global warming impact that is many thousands of times worse than carbon dioxide (CO2). We’ve ranked supermarkets on how well they’re doing to reduce the climate change impacts of their refrigeration. And this year, we’re covering air conditioning too. Last year’s report revealed some progress, with 46 supermarket stores running on climate-friendly refrigeration. A number of retailers were also making firm pledges to move away from HFCs within a set time frame. This year the judges have been very encouraged by the improved commitment of supermarkets in phasing out HFCs. With 239 stores now using climate-friendly refrigeration and many more in the pipeline, they have proved that this is both technically feasible and commercially viable.1 In fact, some have even found ways of saving money and improving on energy efficiency too. 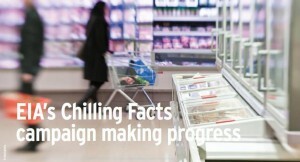 For the first two years, Chilling Facts focused on supermarket refrigeration. This year, we’ve included air conditioning as an issue. Many of these systems also use HFCs, when there are viable alternatives. This entry was posted in aaa, BLOG, Campaigning, Charities & NGOs, Done, Energy & Climate, News 2011, Projects. Bookmark the permalink.